“Divine Love Reigning” ~ By Shweta Mitra, May 4th 2010. 26 years back I had worked on 2 water colors posted here and here, however after that, I have not touched a paint brush till I worked on this painting. . The painting isn’t originally mine; the general scene and theme come from another artist. However, the overall look and feel, the colors and vibe, etc., are very different from the original, and represent a fresh interpretation of Radha and Krishna. And although this is not an original Shweta Mitra painting, it is one that has flowed from the heart and stillness. 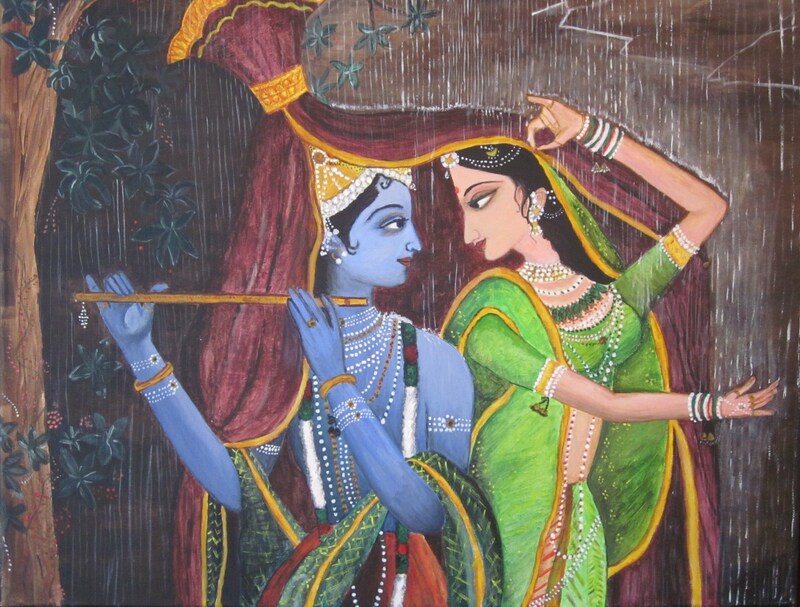 It was lovely to watch the colors merge and create a beautiful Radha and Krishna. I really wish I could say I created this… but any time my mind was actively deciding what to do, the paints and colors just did not flow… then I stopped… became silent… asked the divine/stillness to paint… and everything… the colors, the shades, the paint, the brush strokes… it all just flowed beautifully. I don’t think I have experienced anything like this before. I have this one posted at the Inspiration section too, along with a beautiful poem By Katrine Kristiansen called The Fragrance. Katrine and I independently started working on these pieces about a month ago, without knowledge of each other’s efforts. I was looking for a poem to go with my painting, and she was looking for a painting to go with her poem. We were pleasantly surprised when we did share our creations with each other, and saw how beautifully they fit together.